Keep your dog healthy from the inside out with ArcaNatura's Resolution- 3® System! Three years ago, a trio of veterinarians founded ArcaNatura in France to bring pet lovers new, clinically-proven, natural medicine for their dogs, cats and horses. In 2011, ArcaNatura launched in the U.S. bringing with them a commitment to natural solutions for common ailments like allergies, arthritis and infection. ArcaNatura’s research has found that their natural solutions are more effective than other products that contain active chemical ingredients. From production to shipping, they utilize 100% renewable and sustainable ingredients like soothing plant essential oils and naturally anti-bacterial extracts, while also incorporating fair trade sourcing into production. ArcaNatura’s veterinary solutions tap into nature to treat not only the symptoms, but the root of the pet’s problem. Shampoo ArcaNatura- Scientifically designed by adding three plant extracts to natural surfactants and emollient agents Arcanatura Shampoo is the only natural clinically proven product available. Our shampoo features a unique balance of natural cleansing agents to remove allergens from the skin and fur, moisturizing agents to improve the skin barrier function and anti-inflammatory, anti-histamine and anti-oxidant agents to soothe the itch. Omega-3 DHA- With its unique design, our bottle’s airless pump allows you to deliver pure Omega-3 DHA to your pet by simply adding a small amount of the concentrated liquid to their food once per day. No more trouble with pills; our liquid supplement is simple and effective. We carefully chose our bottle by design to prevent any chance of damage to the Omega-3 DHA from oxidation and/or light exposure. ArcaNatura’s Omega 3 DHA is also nearly odorless and tasteless. The DHA in ArcaNatura’s omega-3 supplement is produced from microalgae, a plant-based, vegan source. The supplement is free of any trace amounts of mercury, PCBs, and dioxins. A plant-based omega-3 supplement is more pure than fish oil for better health results and zero risk of feeding your pet chemicals laced from pollutants in the ocean. Pets, especially babies and seniors, are extra sensitive to toxins and should only be provided with the purest of supplements. ArcaNatura’s Resolution-3 Liver Detox Supplement- In allergic pets, the liver is working overtime to handle all of the histamine and other toxic materials created by the allergic response. ArcaNatura’s Resolution-3 Liver Detox Supplement is a simple spray with natural extracts that is added to your pet’s meals daily as a detoxifying supplement. What Do Customers Say About ArcaNatura's Canine Products? Order Your ArcaNatura's Canine Products Today! Your dog gives your family so much love and joy. 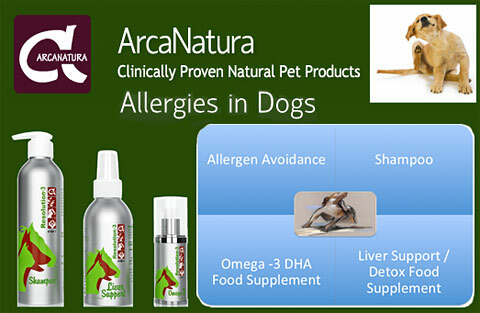 Be sure to give your dog the health support he or she needs for a happy, healthful life by using Arcanatura products. You will see the difference and your dog will feel the difference! For more information about our products and to place your order, please call us today!